From 17 to 19 May I was in Croatia at the invitation of Jurica Carić President of the Croatian Bridge Federation, first attending the memorial Emil Tedeschi Tournament in Zagreb, then for a meeting with Zlateko Mateša the President of the Croatian Olympic Committee and finally to Opatija for a short technical visit. 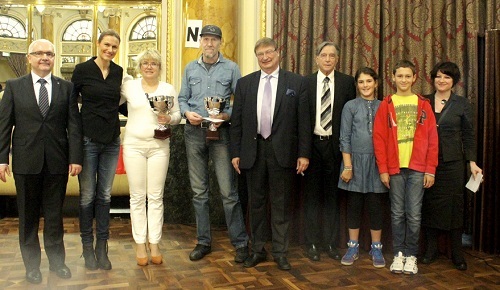 The tournament was organized in the Esplanade Hotel which was built for the Orient Express and the prize giving took place in the presence of his wife Gjurgja, his daughter Lada and his grand children. The winners came from Maribor, Slovenia were Silvana Rojko and Milan Pavlin. On Monday morning May 19th I met Mr Zlatko Mateša President of the Croatian Olympic Committee and EOC board member. Zlatko is a former prime minister of Croatia (1995 to 2000). Mr Mateša is a water polo champion he has also represented Bridge formany years both on the National and European Olympic committee. He is supportive of all Bridge events in Croatia, in particular this year with the European Team Championships to be held in Opatija in June and the FISU World Championships to be held also in Opatija in November. Mr Mateša was particularly interested inthe development of the Youth Bridge, with the tournaments on Internet and communication. Mr Mateša will attend the opening ceremony of EBL Championships inJune. Also attending this meeting was Jurica Carić President of the Croatian Bridge Federation and Josef Harsanyi EBL Executive Member. Then I went to Opatija with Jurica Carić and Josef Harsanyi for a final technical visit. All is in hand in terms of te organization for the 82 teams registered by the deadline of 15th May. A large majority of teams have reserved their accommodation through the Organisation and EBL is waiting to hear about their the flight schedules in order to organize the transfers. Only one thing is pending. It is the building of the new hotel Royal where the Opening Ceremony will normally be held. The Croatian Republik President is expected. Some teams havealso reserved in this hotel. One month before the opening one floor is still missing and only parking are ready! But 300 workers are working 24/24 7/7 and the manager of the hotel seems confident that the hotel will open on June 15th. Good luck! Yves Josef and Jurica in the future ballroom where the opening ceremony is to be held on June 21. On Thursday May 22 I was in Milan with Filippo Palma EBL EC member for a visit to the headquarters of FIGB. I was received by Gianni Medugno FIGB President and Francesco Conforti FIGB General Secretary. The agenda of the meeting was linked to the logistic preparation of the 13th EBL Champions Cup to be held in Milan in November 2014. Everything was checked. 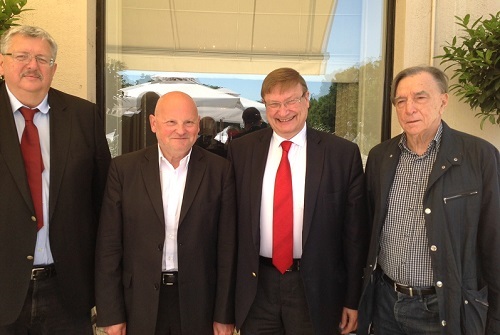 The EBL Executive Committee to be elected in June will also held its first meeting during the Champions Cup in Milan. In addition EBL and FIGB continue discussions about the possible organization in Italy in June 2017 of the 8th European Open Championships.